Despite this recent cold weather, spring is on its way. Many of the flowering trees and shrubs are budding and some are even blooming. There’s a beautiful flowering quince in my neighborhood that’s already showing lots of color. Its clusters of coral colored blooms, each a little over an inch in diameter catch my eye every time I drive by. White flowering varieties are less common but all quince flowers are fragrant. Some newer cultivars are thornless, but many older types will tear you up when you prune them. Thorns are sharp and sturdy, so keep heavy gloves handy. The wood is springy, strong and will snap back at you. Shrubs can grow to ten feet tall with a spread slightly more than that if left unpruned. Individual specimens are very long lived, perhaps for as much as a hundred years. I remember seeing a pair in an old West Virginia cemetery while studying soils in Graduate School. All the gravestones were set before 1900 and the place hadn’t seen any maintenance in years, but these two shrubs were still going strong. These apple and pear relatives have small toothed leaves and grow well in a variety of locations. They tolerate poor soil, shade, and winter temperatures to -30 F. Bloom will be reduced in shady places though. Another drawback is that this spectacular bloom usually only lasts for a couple weeks. For this reason it is not as popular as it once was, but some newer cultivars are repeat bloomers. Quince foliage turns yellow to red in the fall, providing color to the landscape. Dense thorny stems make flowering quince an excellent choice for a hedge to discourage your neighbor’s dog. People aren’t likely to wade through it either and it will puncture a football in short order. Fruits ripen in the fall. They are edible, have a pineapple smell and are rich in vitamin C. Few people eat them fresh since they’re so sour. Yields are quite variable but they make a great addition to jellies. High pectin levels often make adding commercial pectin unnecessary. Flowering quince fruits are a great match for blueberries or elderberries, which are low in natural pectin. 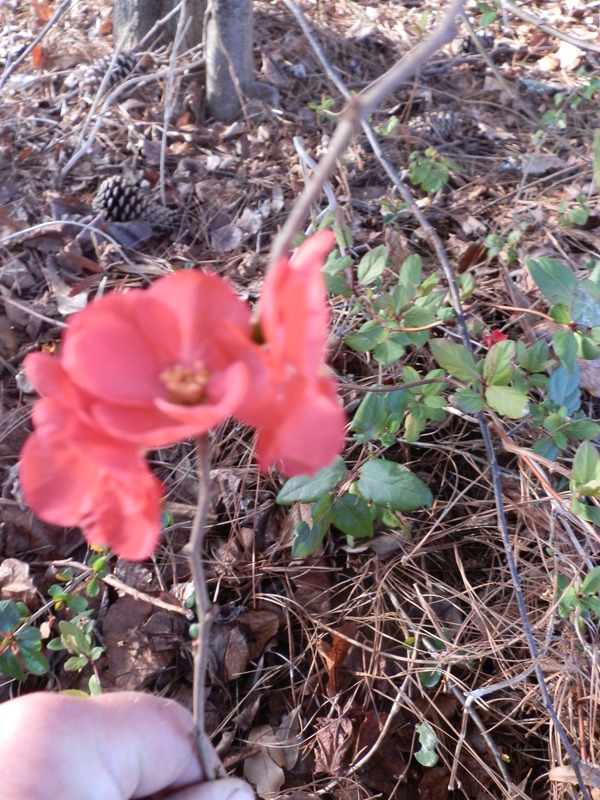 Flowering quince foliage is food for the larvae of some butterflies, and the flowers attract bees. Hummingbirds flock to it. Since this shrub blooms so early, its nectar will draw the birds to your yard before you set out your feeders. Fruits contain tannin compounds which are anti-inflammatory. Tannins inhibit histamine release, causing less swelling. Chlorogenic acid is found in these fruits and is responsible for the anti-inflammatory effects. Because of this, several herbal sources recommend flowering quince for treatment of rheumatoid arthritis. Other reports claim the fruits have anti-microbial properties and strengthen the immune system. Still other sources tout this fruit as a remedy for migraines. It also is supposed to improve digestion. I was unable to find any known drug interactions associated with this fruit, but always check with your doctor before ingesting large doses of herbal supplements. This entry was posted in foraging and tagged anti-inflammatory, chlorogenic acid, early spring flowering, edible fruits, fall foliage, high pectin, hummingbird attractant, long lived. Bookmark the permalink.